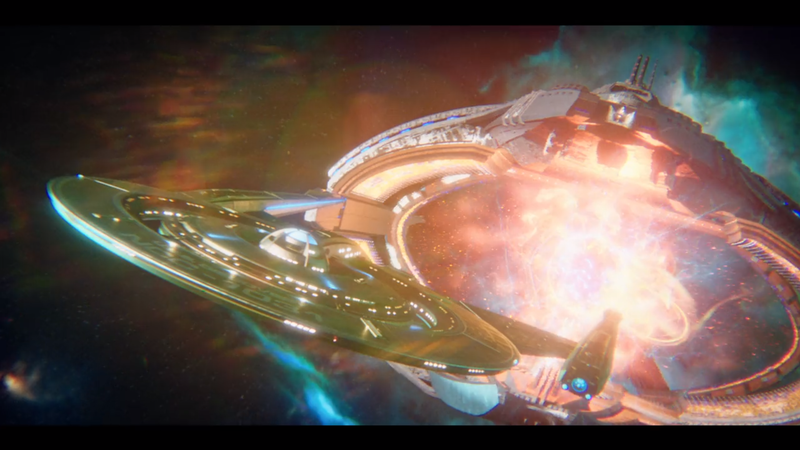 Things are certainly cooking up on Star Trek Discovery! The show’s explosive second season has seen mystery after mystery! What are the red bursts? Who are the Ba’ul? How did Leland get Burnham’s parents killed? What’s going on with Airiam??? Whilst some of the show’s puzzles have already been solved, there’s one BIG question that’s yet to be answered – just who is the Red Angel? And what are they up to? Fans have come up with plenty of their own theories, so we’ve decided to go through the top ten and rate them by likelihood! Sylvia Tilly has been a fan favourite since we first met her all the way back in Season 1. Could she be the Red Angel? With the revelation that the Angel is wearing a mech-suit from from the FUTURE, it seems unlikely – after all, how would Tilly even get to the future in order to get her own mech-suit? BUT, we already know that Tilly has a special relationship with the time-defying mycelioid organisms called the jahSepp, whose realm exists outside of the known universe – maybe Tilly will use this connection to bend time and try to stop a terrible calamity by communicating with the only people she can trust – her Discovery colleagues. The Iconians were discovered to be an advanced race long extinct in an early adventure of Jean Luc Picard and the crew of the Enterprise-D, in the Season 2 episode ‘Contagion’. Using advanced technology, they were able to travel vast distances in the blink of an eye. What’s more, their appearance in the video game ‘Star Trek Online’ is strikingly similar to that of the Angel as we’ve seen it so far. HOWEVER, it turns out that the Red Angel is actually a time traveller from the future, not the past, as when Saru saw it up close, he noted that it was using technology that is much more advanced than Starfleet’s, meaning there was no other possibility than it being from the future – which means case closed on the Iconian theory! Emperor Georgiou is shrouded in mystique, secrecy and suspicious motives. What does she really want? What’s her big plan? She has a complex relationship with Burnham, knowing more about the young officer and mirror of her protege than Burnham knows about herself! With Section 31’s advanced technology that is much more advanced than the Starfleet’s, could Georgiou have found a way to leap across time, and be using such an ability in conjunction with an advanced mech suit to try and prevent a future disaster – and maybe earn her redemption in the process? We’ve already seen Georgiou disguising herself with futuristic-looking technology on the Klingon homeworld – could that same level of technology service her time-hopping mission to redeem herself and save the Galaxy? We think this could be a strong possibility! 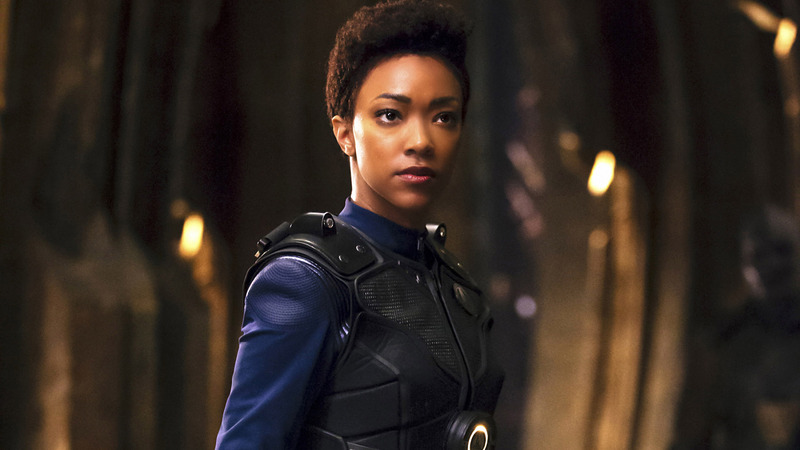 Michael Burnham has been at the centre of the whole Red Angel affair – from being the first member of the Discovery crew to witness the Angel itself, to her family ties to Spock, someone that the Red Angel has been visiting since an early age – even using him to guide his father Sarek to rescue an errant Burnham when she ran away from home, before she could be killed! 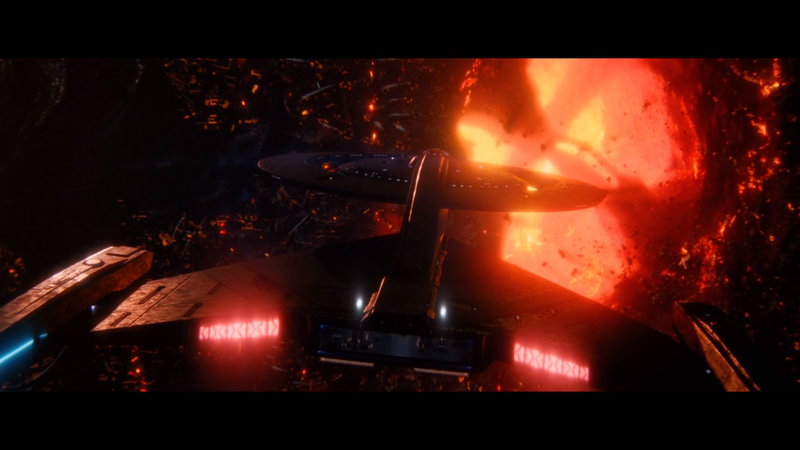 This was after all of the advanced Vulcan sensor technology and tracking systems mysteriously failed under suspicious circumstances, preventing Sarek from finding the human child who was within a few hours’ walking distance of the family home – perhaps a sign of another mysterious force acting to harm Burnham? If Burnham were the Red Angel, she would certainly have all the requisite knowledge of the events that transpire to show up at exactly the right time – some which is knowledge that only Burnham would have. BUT, during the Red Angel’s mind meld with Spock, the Angel seemed to convey all of its visual information in a straightforward, unambiguous fashion, with no sign of any of Burnham’s characteristic long-winded monologues full of semantically-null musings and vague, nondescript allusions to the human condition. This seems like a pretty argumentk against the Burnham-Angel theory to us! Could it be that a long-lived T’Pol gained new-found faith in the theory of time travel? And that, upon its discovery, used it to travel through the ages, averting disasters and preventing catastrophes? Certainly she possesses the intellect and determination to take on such a monumental task – could it be the pointed ears of a Vulcan, not a human, that hide beneath the Red Angel’s futuristic helmet? We think it’s worth at least even odds. If you thought that last theory was out there, just wait until you hear this one! During Spock’s mind meld with the Red Angel, a keen-eyed redditor recognised one of the doomed planets in Spock’s vision as that of Risa – the luxurious, tropical resort planet which first appeared in ‘The Next Generation’, and which was a favourite shore leave destination for one William T. Riker. Top: Risa, as it appeared in Will Riker’s time period. 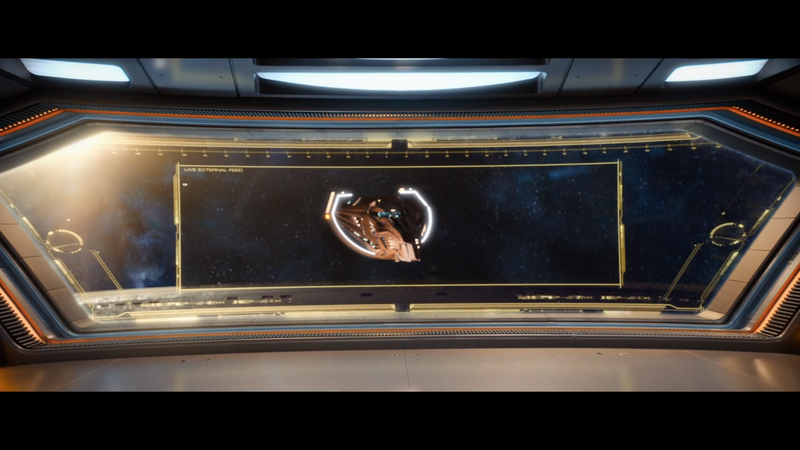 Bottom: Risa’s new look, with new visuals established for ‘Discovery’. That redditor, /u/bovis_stercus, further suggested that IF Risa was destroyed at some future point, could it be that a distraught Will Riker, moments away from arriving at the planet for a fun-filled weekend of sunbathing and no-strings-attached jamaharon, set himself upon a libido-driven rageful quest through time to save Risa and hence save his shore leave plans? The only real votes against this one come from, yet again, the mind meld, where Spock didn’t see any visions of Deanna Troi taking a bath, prolonged close-ups of reflected images in Captain Picard’s head, or lists of reliable topically-applied antibiotic creams suitable for sensitive areas, so it seems unlikely that Riker’s bearded face lies beneath that helmet. It’s a long-shot, but we don’t think it should be ruled out altogether! Spock is more heavily entwined in the Red Angel’s machinations than any other character, having seen the Angel since very early in his life, and having clearly been chosen by it to assist in achieving its objectives. 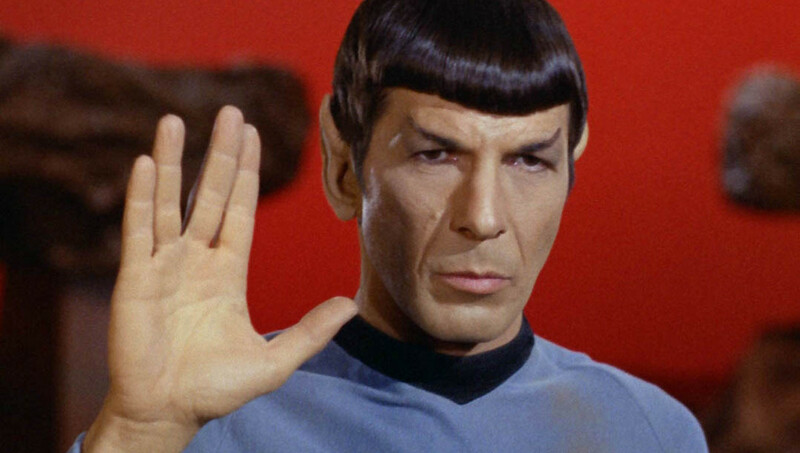 No reason has yet been alluded to for the Angel’s specific interest in Spock, but could it be possible that that it’s simply because the Angel is Spock himself? This theory isn’t water-tight, as it seems like Spock would be well aware of the effect that the Red Angel would have on his mind, and it would seem… illogical to intentionally put himself through that madness, to the point that he required specialist psychic healing by the Talosians. Surely he’d find a more succinct way to communicate with himself? And would he not recognise his own consciousness during the mind meld? We’re not ruling this one out, but we’re not ranking it highly either. The last time we saw Lorca, he was disintegrating under the force of the huge spore turbine at the heart of the Mirror Universe’s I.S.S. Charon. Could the title of the fourth episode of the series, ‘An Obol For Charon’, be a subtle hint at the identity of the Red Angel? Could it be that Lorca wasn’t disintegrated at all, but rather cast through the mycelial network, ending up in some distant future reality where planets are destroyed wholesale? The other alternative is that the Angel is Lorca’s “Prime Universe” counterpart – the good, honourable man who was once a love of Admiral Cornwell, and who we never actually met during the run of the show. Maybe his journey into the Mirror Universe led him to some advanced technology, or some spatial phenomenon which granted him the ability to travel through time? It’s not guaranteed, but it’s not impossible either! Airiam, Discovery’s spore drive officer, and a seemingly artificial, semi-robotic being of ambiguous, if not downright mysterious origins, has been acting weirdly. Ever since her interaction with the malicious code of the robotic cephalopod which attacked Pike’s and Tyler’s shuttle inside the Time Rift, Airiam has been behaving suspiciously and maliciously, doing sneaky things and seemingly under the influence of three sinister dots – some kind of advanced artificial intelligence. Is it possible that Airiam will be sucked into this mess full-fold, and will end up taking on the identity of the Red Angel, her mechanical body changing form to adopt the advanced appearance of the Angel itself? Perhaps using knowledge of time rifts inherited from the malicious future robo-squid code to safely travel through time, causing the red bursts and guiding Discovery around the cosmos? Might this also explain the change in casting for the character, from Sara Mitich to Hannah Cheesman in the second season? Maybe the Red Angel spells the end of Airiam as we know her, and the producers chose to change roles for Mitich to avoid writing her out of the show altogether? This seems like a good bet to us! Titus is a little-known character from the extended lore – a veteran Captain of the starship Fury of Descent, grizzled warrior and saviour of the planet Graia. He’s only ever appeared in one video game spin-off, voiced by the inimitable Mark Strong, which makes him a long shot for the Red Angel. BUT, given that his story takes place nearly 40,000 years after the events of ‘Discovery’, and that he has been exposed to weird and twisted warp energy, AND that he’s already got his own mech suit, he’s a stronger candidate than you might think! He’s even already dressed in ‘Discovery’-era colours – blue uniform with metallic gold command-division trim! EVERYTHING ties together, from the time-altering affects of warp technology in the future, to his demonstrable dedication to self-sacrifice and his unerring determination to save humanity from enemies both without and within. He has both the means and the will to dedicate himself to such a selfless task of travelling through twisted time to save mankind from hostile alien threats. At multiple points, we even see him using jump-packs, allowing him to hover in the air, just as it seems the Red Angel is capable of doing – although it’s doubtful that time travel is an action which is supported by the Codex Astartes. Titus is our “editor’s choice” of Red Angel identities! You’re gonna think we’re crazy, but hear us out on this one. 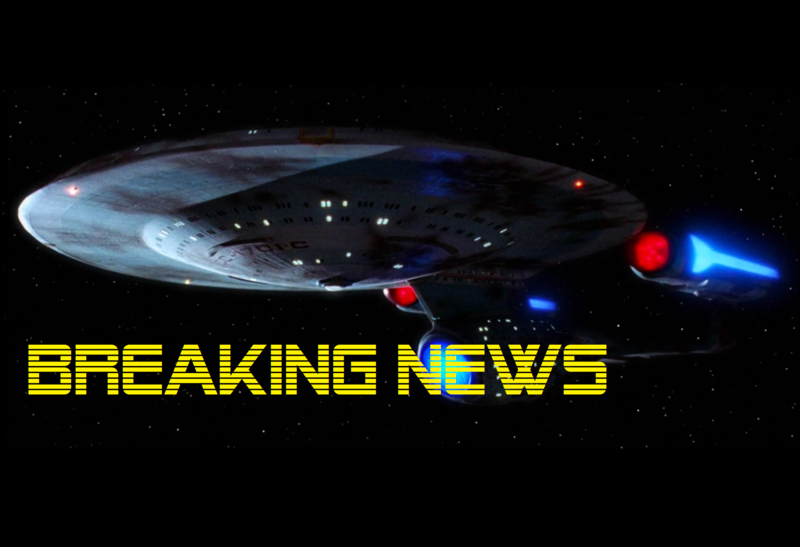 Elon Musk is already established as a part of Star Trek canon, identified by Lorca in Season 1 as a technological pioneer in the company of the Wright Brothers and Zefram Cochrane, and in Season 2 we find out that Ensign Tilly’s highschool is even named after him. Elon Musk is curious figure in our present day – capricious and controversial, but undoubtedly intelligent, driven, and completely open to crazy ideas – who else would launch an electric sports car into the asteroid belt? Within the context of Star Trek, it seems entirely possible that Musk went on a Zefram Cochrane-inspired journey. Perhaps during an early flight of Musk’s into the solar system, a radiation wave hits and he gets shot through a wormhole. Now he’s lost in some distant part of the universe on a ship, a living ship, full of strange alien life forms. “Help me!” he calls, in transmissions back to Earth, “is there anybody out there who can hear me?” Maybe he’s being hunted by an insane military commander, so now he’s doing everything he can – he’s just looking for a way home. Then he finds some kind of a time portal and a mech suit and tries to stop planets from being blown up or something. It’s the longest of long shots, a real Hail Musk, but we think it might be worth a flutter! If so, could we be in store for a cameo by the world-famous entrepreneur and rocketeer? Well, those are our guesses! Got theories of your own? Think we’re completely off the mark? Let us know in the comments! Or stop by Facebook or Twitter to leave us your opinions!